I created the V2 Prototype Concussion Reduction System when my daughter suffered a concussion in an equestrian accident. I vowed that I would find a way to protect all athletes so they could safely participate in sports. Until the V2 Prototype Concussion Reduction System, all efforts to stop concussions have been based solely on the helmet. I realized that I needed to take a systematic approach to absorbing and dissipating the forces of impact thus minimizing their potential for central nervous system damage. 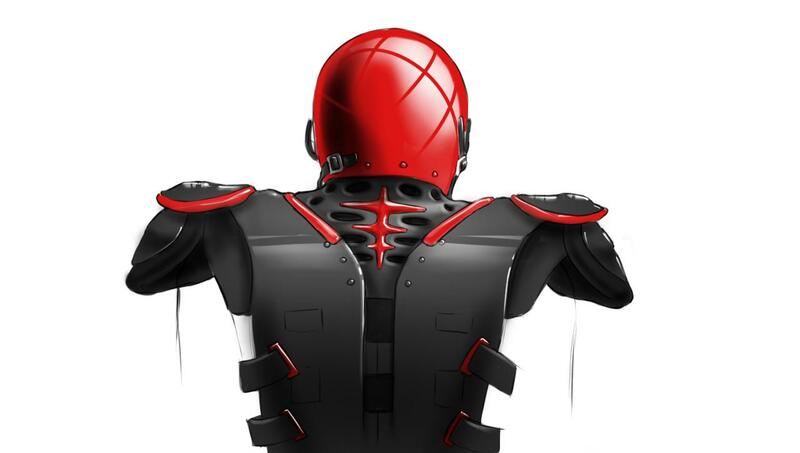 Therefore I created a patented one-piece helmet and shoulder pad design that transfers energy away from the head and redistributes the total force. The product was tested at impacts in excess of 100 G’s at Biokinetics and Associates in Ottawa, Canada. Independent statistical analysis confirmed that one is nearly twice as likely to suffer a concussion when not wearing the V2 Prototype as compared to those using it! One of the added benefits of the V2 Prototype is that the modifications to the current state of the art are minimal. 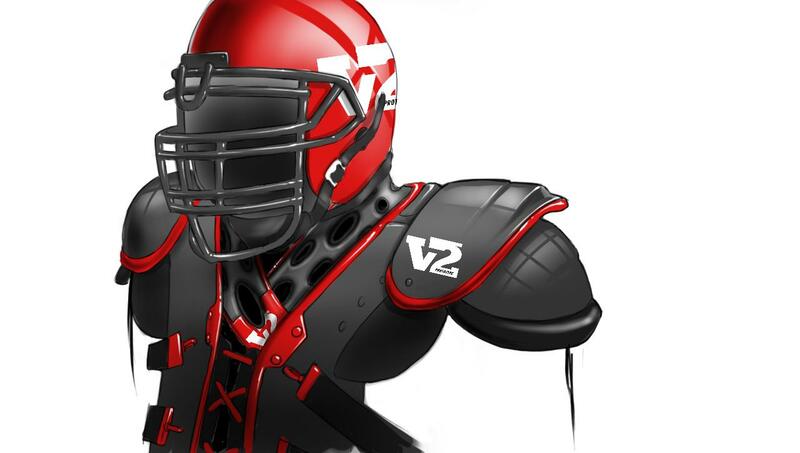 There is no need to create a new helmet technology or a new shoulder pad system. The V2 can drive down the incidence of concussions as well as keep the standard aesthetic that so many players are unwilling to give up. In fact we have even had player feedback that the V2 would make them look even cooler! I don’t believe that the commonly accepted theory of Coup-contrecoup adequately describes the pathology we are now seeing.” Coup-contrecoup is a macroscopic description first proposed by a French surgeon describing brain injury after blunt trauma…this theory is nearly 250 years old and only minimally describes the associated brain injuries. Chris Nowinski and his group out of Boston have shown that the microscopic brain pathology found in people suffering from Chronic Traumatic Encephalopathy (CTE) is found diffusely throughout the brain, not just on superficial and opposite areas that Coup-contrecoup proposes. In fact the brain damage in CTE is nearly identical to that seen in Shaken Baby Syndrome. Many people have described the brain as a gelatinous substance, which is easily shaken and damaged. In reality the brain is not as dense as is jello, but made of different density cell types which develop their own momentum when rapidly decelerated causing through and through axonal shearing and damage. It is this physician’s belief that a more proper name for the epidemic of concussions seen in contact sports would be more appropriately called “Adult Shaken Brain Syndrome”. This too would explain why helmets alone are only minimally able to protect the wearer from concussion causing injury. I think it is great that Dr. Aaron is thinking outside of the box, but as with most inventions; money and research are the biggest hurdle. I hope that Dr. Aaron can fine tune this and get it into the real world to see if there are positive impacts in the concussion realm. seem like the right direction, but the players need to be able to turn their heads. Why not a transparent shell that attaches to the shoulders and leaves the head free to turn? a transparent plastic shell could have holes for air circulation and a traditional face mask attached to the front to protect the face. So the hard shell isn’t even attached to the head. The player could also wear a soft helmet under the shell to provide further protection from blows. Just a thought.